When is the best time to scarify a lawn? Scarifying is a very beneficial lawn treatment and rather than being considered as a remedial maintenance exercise every one to two years, you should consider scarifying as a regular maintenance procedure. During the course of a season dead grass (called thatch) and lateral grass stems build up, thus restricting light and air getting through to the grass roots. As thatch builds it restricts any desired grass and instead moss and weeds are encouraged to take over, leading to a downward spiral in the health of a lawn. A scarifier is in effect a vertical mower with knife blades (or wire tines) spaced out along a reel - much like a cylinder on a mower. These vertical blades act like a vigorous comb, forcing out any build up of rubbish at grass root level. These blades can be lowered, or raised, to combat the depth of thatch, or in some applications, penetrate into any crusty soil layer. The deeper the blades go, and the more extreme and vigorous the action is on the roots, potentially the more beneficial this remedial action has on grass grass root zone. A deep incision into the soil cuts through any shallow grass roots, which in stimulates tillering - tillering occurs when the grass sends out new shoots where a root has been pruned. If this procedure is practised on a regular basis this root pruning will encourage a thicker grass root zone and aid crowding-out of undesirable weeds whilst also discouraging moss. 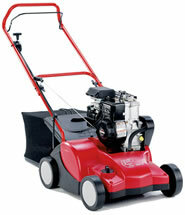 A scarifier can be set just to brush the soil surface without any interference with the roots of the grass. This procedure is effective if you just want to remove a build up of dead grass or take out any unwanted lateral grass growth and is a normal - and especially beneficial - procedure during the active growing season. ,p.A light grooming is recommended at least once a month during active grass growth to deter any major build up of thatch and reduce the need for heavy remedial autumn/winter maintenance. Modern professional mowing machinery is often fitted with a grooming reel set just behind the front roller. Every pass with the mower removes any loose detritus, thus keeping the surface aerated and free from build up of lateral grass growth and thatch. Scarifying a lawn produces an awful lot of arisings and the whole process can be very time consuming so it's advisable to cut your grass at least three days before the scarifying. This will clean up the surface of any leaves and/or debris, such as leaves and twigs, as well as all of the excessive grass growth. Cut the grass again on the day you want to scarify. This will help to remove excessive moisture and a further any growth of grass. Scarifying will produce bundles of dead grass, so cutting first ensures that you are not having to labour through the normal vertical grass growth as well penetrate into the thatch and lateral grass. Set the scarifier blades to the required height - if the lawn is dense and springy then an initial pass just into the surface will clear the way for a second, and lower, pass. If needed, make a third pass so that the scarifier's collection box isn't filled too quickly. Repeat the process as many times as is needed, lowering the vertical cutting blades as you go, until you are satisfied that you have removed sufficient grass and thatch. If thatch and rubbish is still coming out freely then continue until you are confident there is no more to be achieved. It's recommended that every pass is made at 90 degrees from the previous one, this ensures that grass is lifted each time and maximised the efficiency of the machine. Not every scarifier comes with a collection box which means that you may have to collect the grass by raking it up. Rake up as much as possible by hand and then vacuum up any residual clippings with a rotary mowing machine. As a result of thatch removal you may well find there are bare patches left. These bare patches need to be aerated, seeded and dressed to promote new grass. Early autumn is the best time for a deep penetrating scarification and thorough clear out of moss and thatch. The soil is also at the best optimal temperature for grass seed germination. Seeding in autumn also allows enough time for new seed to germinate and for the grass to establish itself well enough for one or two light cuts, with a rotary mower, before it passes into a semi-dormant state for over-wintering. If you are carrying out any scarifying in the spring it is best to wait until the frosts have passed and the soil has warmed sufficiently so that the grass roots may recover sufficiently. Hitting grass roots to hard and too early will shock the plant and cause it to suffer stress meaning that the lawn may take too long to recover before the summer heat. Springtime and throughout the summer - only if conditions are favourable - is best for light to moderate scarification/grooming. Do you need a scarifier? - Click here. I have scarified and aerated the lawn end of April. I saw few patches and thin grasses emerging after 2 weeks.I bought aftercut seed and feed by Westland. can I spread this now to have a healthy green lawn before summer. Do I have to water the lawn if it does not rain 2 days after spreading seed and feed. Should I scerify my lawn first or add weed no feed first and wait for moss to change colour then sherify. Hi. Do you think this will help with an infestation of meadow grass? I have resorted to killing it completely with Roundup and it's even survived that!?! Hi my gardener has scarified my lawn today (30 November) to such an extreme that all that seems to be left is bear earth, is there any hope that it will recover? What should I do?